It is cold outside. In fact, the forecast for this week is for highs and lows all below freezing. While it was around 25 degrees this afternoon, I took my bike out for a short ride because, like nearly every one else, I am out of shape and restless for exercise. 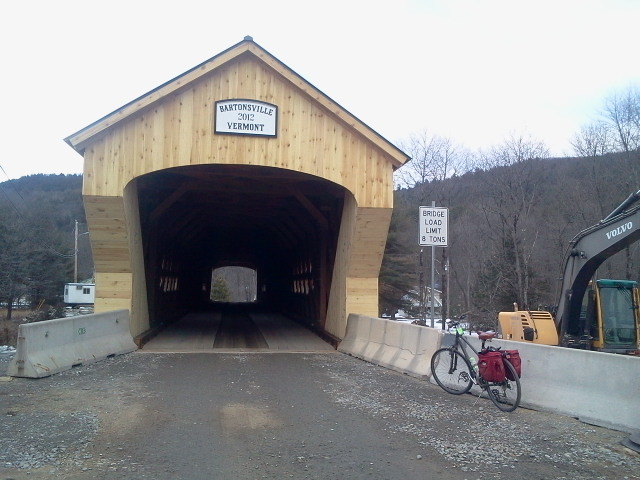 I rode down to the newly opened bridge, as I often did on my summer rides before the bridge washed out in 2011. I am fascinated by the concept of culture’s values and the place of the Arts in communicating them. Even though I taught as a music teacher, I was never convinced the fine arts were essential to our individual and communal well-being. And yet, even before I began to be persuaded, I had introduced poetry reading to the dinner table in order to rescue our conversation from mind-numbing blather. And lo! I discovered my kids and husband can engage their fine minds to something more exciting than sophomoric humor, making connections to things they have learned elsewhere and thereby enriching me, as well. I was out the night they saw Dead Poets Society (which I saw once upon a time) but since then my husband and the teens have brought it up often. The introductory essay in How Does a Poem Mean?, which I have been reading aloud recently, has sparked good conversation about poetry. They tell me what they learned in Dead Poets confirms what they are hearing in the essay. The essay tells us we cannot give poems the scientific treatment. “Oh! That’s like when the teacher has them rip out the pages of the book!” they said. This satisfies some deep part of my soul, which isn’t content to make meals, clean bathrooms, and oversee lessons. I cherish these discussions! They often turn to address our destructive habits, such as time-wasting on internet. The things I would like to change in my home but seem to have no power to address head-on, the kids bring up naturally after they encounter a poet. So. No dithering; my duty is clear. It is time to do the hard work of exercise. I will continue to read poetry as well as the Bible to lead my children into wisdom. I will dip into poesy and books about it every opportunity I get. After all, they are a bridge over the flood of everyday affairs and a way to wisdom. This entry was posted in Art, Biking, Culture, Literature, Poetry, Stories of Home and tagged Biking, bridge, poesy, poetry. Bookmark the permalink. Yes, three! I forgot the Literature book was yours too. It is a good one. Yesterday I reread The Kingdom Trilogy, which is poesy, for sure. Remember those books? Another Elizabeth Goudge fan! No one writes like her. We have to get together over a pot of tea. Let’s put it on the calendar.